Eomesodermin also known as T-box brain protein 2 (Tbr2) is a protein that in humans is encoded by the EOMES gene. 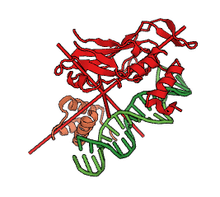 The Eomesodermin/Tbr2 gene, EOMES, encodes a member of a conserved protein family that shares a common DNA-binding domain, the T-box. T-box genes encode transcription factors, which control gene expression, involved in the regulation of developmental processes. Eomesodermin/Tbr2 itself controls regulation of radial glia, as well as other related cells. Eomesodermin/Tbr2 has also been found to have a role in immune response, and there exists some loose evidence for its connections in other systems. Eomesodermin/Tbr2 is expressed highly in the intermediate progenitor stage of the developing neuron. Neurons, the primary functional cells of the brain, are developed from radial glia cells. This process of cells developing into other types of cells is called differentiation. Radial glia are present in the ventricular zone of the brain, which are on the lateral walls of the lateral ventricles. Radial glia divide and migrate towards the surface of the brain, the cerebral cortex. During this migration, there are three stages of cellular development: radial glia, intermediate progenitors, and postmitotic projection neurons. Radial glia express Pax6, while intermediate progenitor cells express Eomesodermin/Tbr2, and postmitotic projection neurons express Tbr1. This process, known as neurogenesis, occurs mainly in the developing cortex before the organism has fully developed, and thus Eomesodermin/Tbr2 has been implicated in neurodevelopment. However, neurogenesis has been found to occur to some extent in the ventricular zone in fully developed organisms. It has been found experimentally through knock out studies, that mice lacking Eomesodermin/Tbr2 during early development have a reduced number of actively dividing cells, called proliferating cells, in the subventricular zone, a key area of neurogenesis in the brain. This, may lead to the microcephaly (small head size due to improper brain development) seen in Eomesodermin/Tbr2 deficient mice. Eomesodermin/Tbr2 lacking mice have smaller upper cortical layers and a smaller sub ventricular zone in the brain, and have an absence of a mitral cell (neurons involved in the olfactory pathway) layer, with mitral cells instead being scattered about. On the behavioral side, Eomesodermin/Tbr2 lacking mice show high anger levels and perform infanticide. Eomesodermin/Tbr2 lacking mice also seem to have problems with long axon connections. Axons are projections from neurons that connect with other cells in what is called a synapse and send neurotransmitters. In this way, they can communicate with other cells, and form the processing that allows are brains to function. Eomesodermin/Tbr2 lacking mice seem to lack fully formed commissural fibers, which connect the two hemispheres of the brain, and lack the corpus callosum, another region of the brain involved in hemisphere connections. that early in development, Eomesodermin/Tbr2 controls early differentiation of the cardiac mesoderm. In fact, lack of Eomesodermin/Tbr2 seems to cause cells to fail to differentiate into cardiomyocytes, which are heart muscle cells. 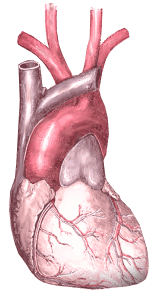 Eomesodermin/Tbr2 controls the expression of cardiac specific genes Mesp1, Myl7, Myl2, Myocardin,Nkx2.5 and Mef2c. Additionally, although neurogenesis occurs primarily in the early stages of development, there are locations within the brain that have been discovered to perform neurogenesis into adulthood. One of these areas, the hippocampus, which is involved in memory formation, shows decreased neurogenesis when Eomesodermin/Tbr2 is removed. It was also found that Eomesodermin/Tbr2 functions by reducing amounts of Sox2, which is associated with radial glia. Another study found that mice without Eomesodermin/Tbr2 lacked long term memory formation, which may relate to Eomesodermin/Tbr2's effects on the hippocampus. Eomesodermin/Tbr2 is highly expressed in CD8+ T cells, but not CD4+ T cells. CD4+ T cells are the helper T cells which detect foreign particles in the body, and call CD8+ T cells to facilitate death of the foreign particles. Eomesodermin/Tbr2 was found to play a role in the anti cancer properties of CD8+ T cells. Lack of Eomesodermin/Tbr2, alongside T bet another T box proteincaused CD8+ T cells to not penetrate tumors so they could perform their anti cancer duties. Eomesodermin/Tbr2 prevents CD8+ cells from differentiating into other types of T cells, but does not play a role in the production of CD8+ T cells itself. Despite Eomesodermin/Tbr2 playing a role in the ability of CD8+ T cells to penetrate tumors, it only plays a small role in production of Interferon-gamma, which is a molecule that communicates to other immune cells during an immune response. ↑ "Diseases that are genetically associated with EOMES view/edit references on wikidata". ↑ "Entrez Gene: Eomesodermin". Retrieved 2011-11-01. 1 2 3 Arnold SJ, Huang GJ, Cheung AF, Era T, Nishikawa S, Bikoff EK, Molnár Z, Robertson EJ, Groszer M (2008). "The T-box transcription factor Eomes/Tbr2 regulates neurogenesis in the cortical subventricular zone". Genes & Development. 22 (18): 2479–84. doi:10.1101/gad.475408. PMC 2546697 . PMID 18794345. 1 2 3 4 5 6 7 Zhu Y, Ju S, Chen E, Dai S, Li C, Morel P, Liu L, Zhang X, Lu B (Sep 2010). "T-bet and eomesodermin are required for T cell-mediated antitumor immune responses". Journal of Immunology. 185 (6): 3174–83. doi:10.4049/jimmunol.1000749. PMID 20713880. 1 2 3 4 Englund C, Fink A, Lau C, Pham D, Daza RA, Bulfone A, Kowalczyk T, Hevner RF (Jan 2005). "Pax6, Tbr2, and Tbr1 are expressed sequentially by radial glia, intermediate progenitor cells, and postmitotic neurons in developing neocortex". The Journal of Neuroscience. 25 (1): 247–51. doi:10.1523/JNEUROSCI.2899-04.2005. PMID 15634788. ↑ Quiñones-Hinojosa A, Sanai N, Soriano-Navarro M, Gonzalez-Perez O, Mirzadeh Z, Gil-Perotin S, Romero-Rodriguez R, Berger MS, Garcia-Verdugo JM, Alvarez-Buylla A (Jan 2006). "Cellular composition and cytoarchitecture of the adult human subventricular zone: a niche of neural stem cells". The Journal of Comparative Neurology. 494 (3): 415–34. doi:10.1002/cne.20798. PMID 16320258. ↑ Ming GL, Song H (May 2011). "Adult neurogenesis in the mammalian brain: significant answers and significant questions". Neuron. 70 (4): 687–702. doi:10.1016/j.neuron.2011.05.001. PMC 3106107 . PMID 21609825. 1 2 3 4 5 Sessa A, Mao CA, Hadjantonakis AK, Klein WH, Broccoli V (Oct 2008). "Tbr2 directs conversion of radial glia into basal precursors and guides neuronal amplification by indirect neurogenesis in the developing neocortex glish". Neuron. 60 (1): 56–69. doi:10.1016/j.neuron.2008.09.028. PMC 2887762 . PMID 18940588. 1 2 Costello I, Pimeisl IM, Dräger S, Bikoff EK, Robertson EJ, Arnold SJ (Sep 2011). "The T-box transcription factor Eomesodermin acts upstream of Mesp1 to specify cardiac mesoderm during mouse gastrulation". Nature Cell Biology. 13 (9): 1084–91. doi:10.1038/ncb2304. PMC 4531310 . PMID 21822279. 1 2 Hodge RD, Nelson BR, Kahoud RJ, Yang R, Mussar KE, Reiner SL, Hevner RF (May 2012). "Tbr2 is essential for hippocampal lineage progression from neural stem cells to intermediate progenitors and neurons". The Journal of Neuroscience. 32 (18): 6275–87. doi:10.1523/JNEUROSCI.0532-12.2012. PMC 3366485 . PMID 22553033. ↑ Knox JJ, Cosma GL, Betts MR, McLane LM (2014-05-14). "Characterization of T-bet and eomes in peripheral human immune cells". Frontiers in Immunology. 5: 217. doi:10.3389/fimmu.2014.00217. PMC 4030168 . PMID 24860576. Kimura N, Nakashima K, Ueno M, Kiyama H, Taga T (Jun 1999). "A novel mammalian T-box-containing gene, Tbr2, expressed in mouse developing brain". Brain Research. Developmental Brain Research. 115 (2): 183–93. doi:10.1016/s0165-3806(99)00064-4. PMID 10407135. Intlekofer AM, Takemoto N, Wherry EJ, Longworth SA, Northrup JT, Palanivel VR, Mullen AC, Gasink CR, Kaech SM, Miller JD, Gapin L, Ryan K, Russ AP, Lindsten T, Orange JS, Goldrath AW, Ahmed R, Reiner SL (Dec 2005). "Effector and memory CD8+ T cell fate coupled by T-bet and eomesodermin". Nature Immunology. 6 (12): 1236–44. doi:10.1038/ni1268. PMID 16273099. Baala L, Briault S, Etchevers HC, Laumonnier F, Natiq A, Amiel J, Boddaert N, Picard C, Sbiti A, Asermouh A, Attié-Bitach T, Encha-Razavi F, Munnich A, Sefiani A, Lyonnet S (Apr 2007). 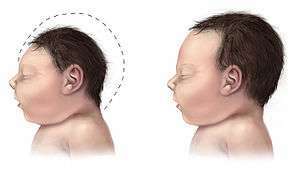 "Homozygous silencing of T-box transcription factor EOMES leads to microcephaly with polymicrogyria and corpus callosum agenesis". Nature Genetics. 39 (4): 454–6. doi:10.1038/ng1993. PMID 17353897. Atreya I, Schimanski CC, Becker C, Wirtz S, Dornhoff H, Schnürer E, Berger MR, Galle PR, Herr W, Neurath MF (Nov 2007). "The T-box transcription factor eomesodermin controls CD8 T cell activity and lymph node metastasis in human colorectal cancer". Gut. 56 (11): 1572–8. doi:10.1136/gut.2006.117812. PMC 2095672 . PMID 17566017. Araki Y, Fann M, Wersto R, Weng NP (Jun 2008). "Histone acetylation facilitates rapid and robust memory CD8 T cell response through differential expression of effector molecules (eomesodermin and its targets: perforin and granzyme B)". Journal of Immunology. 180 (12): 8102–8. doi:10.4049/jimmunol.180.12.8102. PMC 2493419 . PMID 18523274. Sessa A, Mao CA, Hadjantonakis AK, Klein WH, Broccoli V (Oct 2008). "Tbr2 directs conversion of radial glia into basal precursors and guides neuronal amplification by indirect neurogenesis in the developing neocortex". Neuron. 60 (1): 56–69. doi:10.1016/j.neuron.2008.09.028. PMC 2887762 . PMID 18940588. D'Cruz LM, Rubinstein MP, Goldrath AW (Apr 2009). "Surviving the crash: transitioning from effector to memory CD8+ T cell". Seminars in Immunology. 21 (2): 92–8. doi:10.1016/j.smim.2009.02.002. PMC 2671236 . PMID 19269192. Wang HT, Ge XS, Xue ZP, Li BQ (Jan 2010). "[Role of transcription factor T-bet and Eomes in IFN-gamma secretion of different human T cell subsets]". Xi Bao Yu Fen Zi Mian Yi Xue Za Zhi = Chinese Journal of Cellular and Molecular Immunology. 26 (1): 31–4. PMID 20056084. Narayanan S, Silva R, Peruzzi G, Alvarez Y, Simhadri VR, Debell K, Coligan JE, Borrego F (2010). Unutmaz D, ed. "Human Th1 cells that express CD300a are polyfunctional and after stimulation up-regulate the T-box transcription factor eomesodermin". PloS One. 5 (5): e10636. doi:10.1371/journal.pone.0010636. PMC 2869357 . PMID 20498708. Kinjyo I, Gordon SM, Intlekofer AM, Dowdell K, Mooney EC, Caricchio R, Grupp SA, Teachey DT, Rao VK, Lindsten T, Reiner SL (Dec 2010). "Cutting edge: Lymphoproliferation caused by Fas deficiency is dependent on the transcription factor eomesodermin". Journal of Immunology. 185 (12): 7151–5. doi:10.4049/jimmunol.1003193. PMC 2997140 . PMID 21076068.